Gooseberry (nellikkai/AmlA) is very good for health as it contains a lot of iron and other nutrients that provide not only long life but also trouble free health. I have seen while going to certain southern cities in India where they sell salted gooseberries by pricking tiny holes and blanching in very hot saline (salt) water for about 10 to 15 minutes. People used to buy and eat this for good health. Here I am providing you a short method using these for pickling which is entirely different from my earlier posting. Wash the berries well and wipe thoroughly by a dry cloth. Heat water sufficiently as to allow all the berries soak. When it boils remove from the fire and put off the flame. Place all the washed berries in the boiled water for about fifteen minutes. Remove them and place them in cold water and immediately deseed all by separating the segments. Cold dry under a ceiling fan by placing these over tissue paper or dry cloth. Instead of blanching like this, you can also place the washed berries in a small bowl with a little water and pressure cook with three to four whistles and then deseed as described. Now take water to cover up all these segments and add the sugar and heat. Keep stirring till the entire sugar dissolves. Place the dried segments into this and boil for just 10 minutes. Put off the flame, add powdered cardamom and mix gently. Keep the segments with syrup in a airtight bottle and refrigerate. Keep shaking the bottle gently once daily. You can use it in empty stomach after a week. Those who want to store these outside, must boil them well till the syrup thickens and forms a coating on the segment. 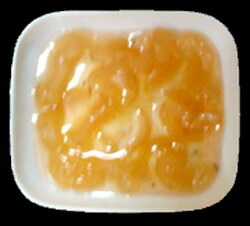 Spread thereafter the segments on a plate and dry under the sun well. After they cool store in a bottle for use. 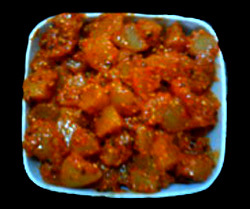 Similarly we can prepare hot Gooseberry pickle. Instead of putting the dried segments in syrup we keep them in a bottle after cold drying and add turmeric powder as well as salt. Close the lid tightly and keep in the fridge shaking at least once daily. After a week take a kaDai (wok) and add a ladle of oil (preferably pure sesame oil). Add mustard and when it splutters add the goose berry segments from the bottle. Add also pre roasted and powdered fenugreek, mustard as well as the asafoetida. Stir gently to spread the ingredients evenly. Place it again in the bottle and refrigerate. You can use it from the next day along with curd rice or sambar or plain split gram dal rice. This entry was posted on August 20, 2015 at 5:27 pm and is filed under Indian Pickles with tags amla, asafoetida, blanched pickle., cardamom, chilli powder, fenugreek, gooseberry, mustard, nellikkAi, pickle, salt, sesame oil, sugar, syrup, turmeric powder. You can follow any responses to this entry through the RSS 2.0 feed. Both comments and pings are currently closed.